Although The Flash has featured a number of villains from the DC Comics, the show largely revolves around one antagonist each season. In its first year, The Flash pit Barry Allen (Grant Gustin) against his first major villain in the form of Reverse-Flash, who turned out to be Eobard Thawne (Matt Letscher) disguised as Harrison Wells (Tom Cavanaugh). Now, in season 2, Team Flash is currently facing an even more dangerous foe, Zoom, who hails from Earth-2. 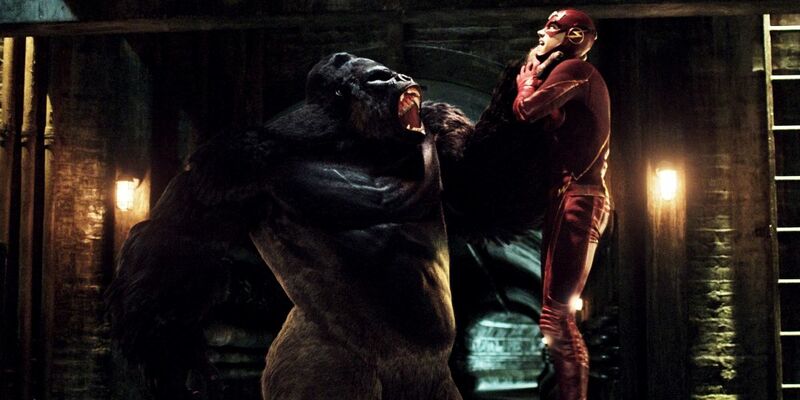 Earlier in season 2, though, Barry again faced a villain that was introduced in season 1: Gorilla Grodd. In 'Gorilla Warfare' Team Flash managed to send Grodd to a location on Earth-2 where he will be surrounded by other hyper-intelligent gorillas, known from the comics as Gorilla City. Now, The Flash executive producer Andrew Kreisberg has teased the return of Grodd and Gorilla City. "I would liken the Gorilla City thing to Ra’s al Ghul. You know, you hear about “the man from Nanda Parbat” in [Arrow] Season 1, and “the man who showed Malcolm the way,” and then you met Nyssa, then in Season 3 you met Ra’s. So, it’s a long-term thing." Gorilla Grodd was first mentioned on The Flash in the show's pilot episode, and it has since been revealed he was experimented on by Eobard Thawne and General Wade Eiling. Additionally, as a result of the S.T.A.R. Labs particle accelerator explosion, he developed hyper-intelligence and mind control powers. Last we saw of Gorilla Grodd, The Flash and Wells managed to send him through a breach and viewers saw a wide shot of Gorilla City. Though it seemed at the time to simply be a tease of the civilization of intelligent gorillas, now it appears The Flash will eventually revisit Gorilla City. Of course, the timeline for bringing Grodd back to the show is uncertain, other than it won't happen until at least season 3. But, considering the long-term plan of Ra's al Ghul on Arrow, and the fact that The Flash first introduced Grodd in its pilot, it seems the producers have hoped to explore Gorilla City since the show’s beginning. Of course, there may be limitations on how much The Flash can venture into Gorilla City since the show's budget may not afford for very much in the way of visual effects -- or, CGI-rendered gorillas. So it's unclear how the series will manage to pull off a multi-episode arc focusing on Grodd and Gorilla City. Still, since Grodd is a fan-favorite villain, both from the comics and now from the show, any return to the character could prove to be an exciting turn for The Flash. The Flash will return on Tuesday, January 19th, 2016, while Arrow will return on Wednesday, January 20th, 2016 and Legends of Tomorrow will see its series premiere on Thursday, January 21st, 2016.